This medication is used to improve the appearance of the skin by reducing fine lines and wrinkles, reducing roughness, and improving skin color. It should be used with a skin care and sunlight-avoidance program that includes moisturizer and daily use of an effective sunscreen (minimum SPF 15). Tretinoin belongs to a class of medications called retinoids. It works by affecting the growth of skin cells. Tretinoin does not repair sun-damaged skin or reverse aging due to sun exposure. Read the Patient Information Leaflet available from your pharmacist before you start using this medication and each time you get a refill. Ask your doctor or pharmacist if you have any questions. Gently clean your face with a mild or soapless cleanser and pat skin dry. Wait 20-30 minutes before applying this medication. Apply a pea-sized amount of cream, using just enough to cover your entire face lightly, usually once a day before bedtime or as directed by your doctor. Be careful to avoid your eyes, nostrils and mouth. Do not wash your face or apply another skin care product for at least 1 hour after using this product. Do not use more of this medication than prescribed or use it more often. It will not give you faster or better results, but will increase the risk of developing redness, peeling and pain. Do not use on cut, scraped, sunburned, or eczema-affected skin. Effects of this medication will appear slowly, with most improvement seen in the first 6 months of use. If used for acne, your condition may worsen at first, then improve. 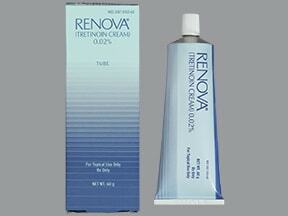 What conditions does Renova Cream treat? A brief sensation of warmth or stinging may occur immediately after applying the medication. Skin redness, dryness, itching, scaling, mild burning, or worsening of acne may occur during the first 2-4 weeks of using the medication. These effects usually decrease with continued use. A daytime moisturizer may be helpful for very dry skin (see Notes). If any of these effects persist or worsen, notify your doctor or pharmacist promptly. Your doctor may want you to decrease how often you use tretinoin, change the strength, or have you stop using it. Notify your doctor if you experience: blistering, crusting, severe burning/swelling of the skin, eye redness and watering (conjunctivitis), eyelid swelling, darkening or lightening of skin color. List Renova Cream side effects by likelihood and severity. Before using tretinoin, tell your doctor or pharmacist if you are allergic to it; or to vitamin A-related drugs (other retinoids such as isotretinoin); or if you have any other allergies. This product may contain inactive ingredients, which can cause allergic reactions or other problems. Talk to your pharmacist for more details. What should I know regarding pregnancy, nursing and administering Renova Cream to children or the elderly? Some products that may interact with this drug include: hair perming solutions, alcohol/lime/menthol-containing products (such as astringents, toners, shaving lotions), medicated or abrasive soaps and cleansers, products containing alpha hydroxy acid, products containing glycolic acid, products containing sulfur, resorcinol or salicylic acid, soaps and cosmetics with a strong drying effect, other drugs that may increase your sensitivity to sunlight (e.g., fluoroquinolones such as ciprofloxacin, tetracyclines, thiazide water pills such as hydrochlorothiazide, sulfa drugs such as sulfamethoxazole, phenothiazines such as chlorpromazine). Benzoyl peroxide should not be applied at the same time as this medication. Does Renova Cream interact with other medications? Cosmetics may be used 1 hour after applying tretinoin. Be sure to clean skin well before applying the medication. Daily moisturizer should be used to protect your skin from dryness. Store at room temperature at 77 degrees F (25 degrees C) away from light and moisture. Brief storage at 59-86 degrees F (15-30 degrees C) is permitted. Do not freeze. Keep all medicines away from children and pets. 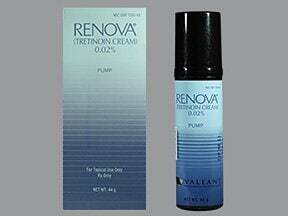 Are you taking Renova Cream? Are you considering switching to Renova Cream? 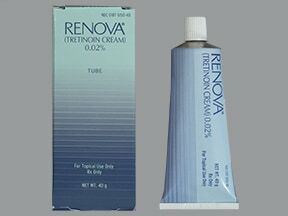 How long have you been taking Renova Cream?